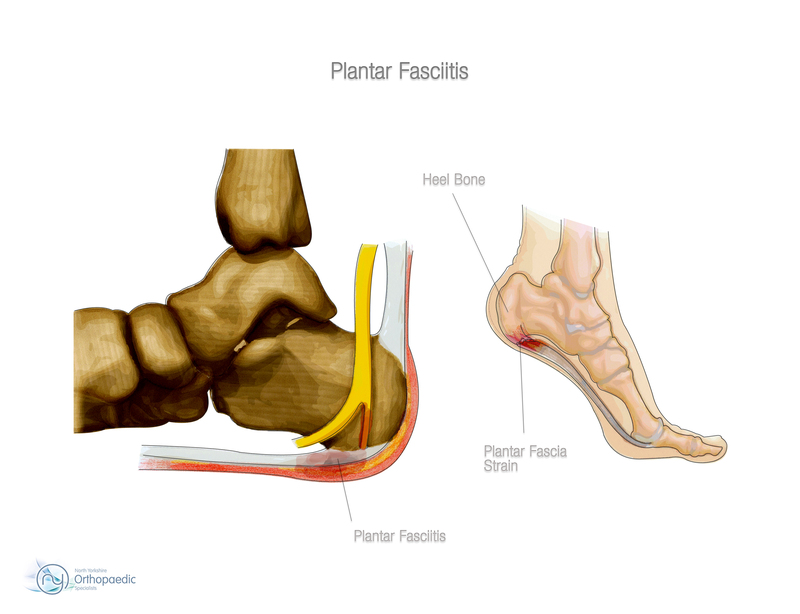 Plantar fasciitis (fashee-EYE-tiss) is the most common cause of pain on the bottom of the heel. Approximately 2 million patients are treated for this condition every year. Plantar fasciitis occurs when the strong band of tissue that supports the arch of your foot becomes irritated and inflamed. Although many people with plantar fasciitis have heel spurs, spurs are not the cause of plantar fasciitis pain. 1 out of 10 people has heel spurs, but only 1 out of 20 people (5%) with heel spurs has foot pain. Because the spur is not the cause of plantar fasciitis, the pain can be treated without removing the spur. It is likely that you will require and x-ray to help to make sure your heel pain is caused by plantar fasciitis and not another problem, such as fractures or arthritis. Heel spurs can also be seen on an x-ray. Other imaging tests, such as magnetic resonance imaging (MRI) and ultrasound, are not routinely used to diagnose plantar fasciitis. However, an MRI scan may be used if the heel pain is not relieved by initial treatment methods. Decreasing or even stopping the activities that make the pain worse is the first step in reducing the pain. You may need to stop athletic activities where your feet pound on hard surfaces (for example, running or aerobics). Rolling your foot over a cold water bottle or ice for 20 minutes is effective. This can be done 3 to 4 times a day. Drugs such as ibuprofen or naproxen reduce pain and inflammation. Using the medication for more than 1 month should be reviewed with your GP or Consultant. Cortisone, a type of steroid, is a powerful anti-inflammatory medication. It can be injected into the plantar fascia to reduce inflammation and pain. Your Consultant may limit your injections. Multiple steroid injections can cause the plantar fascia to rupture (tear), which can lead to a flat foot and chronic pain. Soft heel pads can provide extra support. Your Consultant may suggest that you work with a physiotherapist on an exercise program that focuses on stretching your calf muscles and plantar fascia. In addition to exercises like the ones mentioned above, a physio programme may involve specialised ice treatments, massage, and medication to decrease inflammation around the plantar fascia. During this procedure, high-energy shockwave impulses stimulate the healing process in damaged plantar fascia tissue. Gastrocnemius recession. This is a surgical lengthening of the calf (gastrocnemius) muscles. Because tight calf muscles place increased stress on the plantar fascia, this procedure is useful for patients who still have difficulty flexing their feet, despite a year of calf stretches. In gastrocnemius recession, one of the two muscles that make up the calf is lengthened to increase the motion of the ankle. The procedure can be performed with a traditional, open incision or with a smaller incision by an arthroscopy. Plantar fascia release. If you have a normal range of ankle motion and continued heel pain, your Consultant may recommend a partial release procedure. During surgery, the plantar fascia ligament is partially cut to relieve tension in the tissue. If you have a large bone spur, it will be removed, as well. The procedure may be performed arthroscopically or open. You can go home soon after the operation. The anaesthetic will wear off after approximately 6 hours. Simple analgesia (pain killers) usually controls the pain and should be started before the anaesthetic has worn off. The foot should be elevated as much as possible for the first 5 days. The dressing is removed soon after your operation. The wound is cleaned and redressed with a simple dressing. Any sutures (stitches) will be removed at about 10 days. You should notice an improvement in symptoms within a few days but the final result may take upto 3 months. Keep the wound dry until the stitches are out at 10 days. The foot needs to have full control of the pedals. You are advised to avoid driving until you have full movement and control back in your foot. Everyone has different work environments. Returning to heavy manual labour should be prevented for approximately 4 - 6 weeks. Early return to heavy work may cause the tendons and nerve to scar into the released ligament. You will be given advice on your own particular situation. Reflex Sympathetic Dystrophy - RSD (<1% people suffer a reaction to surgery which can occur with any surgery from a minor procedure to a complex reconstruction).